Sean697 had the most liked content! Due to unforeseen life circumstances this got put on the back burner. Hope to get back in the swing of things in August. Long story , but a lot of family stuff. They actually have a pretty formal cover. With title and sometimes a large image. Until I have a place to put these.... I uploaded the 3 issues I have done so far to the file server in my folder staging area. Including cover images. Will continue to stage them there as I complete them till I can get them on the site when database and DL and Gallery sections made. This sounds great. I was actually wanting to use the games database like this. 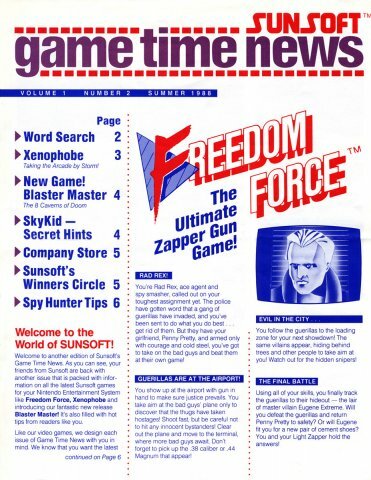 When I was done scanning my stuff I wanted to index magazines to the games pages. Like go through every magazine and every mention of a game fill that info into the games page. So say I'm going through EGM 9 or something. The super Mario 3 review. I'd put that information on the Super Mario Bros 3 page that in EGM 9 you can find a review on page 35. But what your proposing sounds sounds even better. 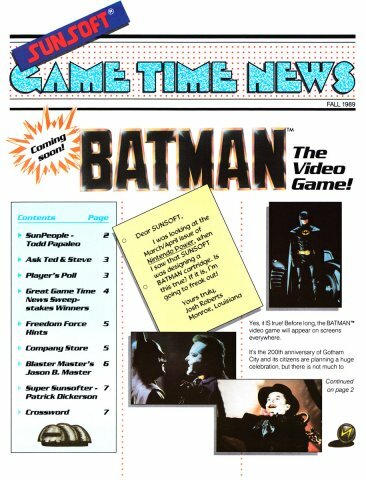 Honestly it could go in the magazine database as it's similar to Nintendo Fun Club News. 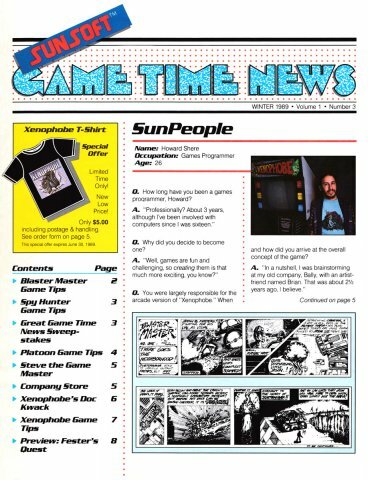 So I am going to start scanning in the issues of the Sunsoft Game Time News newsletters. I need a database created. Also if anyone has additional information to fill in. So far through researched Ive more or less confirmed the following. The numbering only lasted the first 3 issues. (Vol 1 . Number 1-3). After that it was just by season or month. 1. Sunsoft Game Time News issue 1: There is no known info I could find on the internet on this. Only that it has a 1988 release date. Need a cover scan or any information on release. A true mystery. 2. Summer 1988- Vol 1 issue 2. I can get a cover image. I will be scanning the following issues and have verified with multiple sources these are the rest that exist. 3. 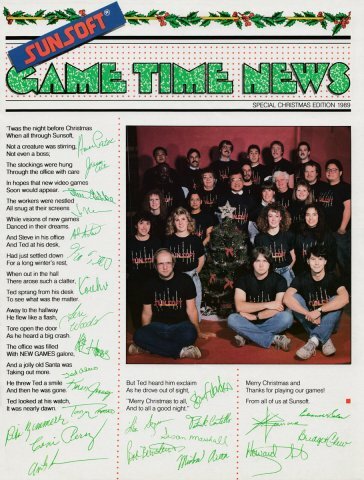 Winter 1989- Vol 1 issue 3 4. Fall 1989 5. Special Christmas Edition 1989 6. Spring 1990 7. Summer 1990 8. Winter 1991 9. Spring 1992 10. Fall 1992 Any information people have would be appreciated. But ill need a database created. I was actually going to do this issue next. I recently have spent the last month and a half traveling and taking care of family issues. I'd be willing to edit when I have time to get back into scanning shortly.